I really want to go make a sandwich and eat it, so this is going to be a short and sweet post (as short as I’m capable of, at least. I’m usually the one leaving multiple-paragraph comments on FB statuses, after all). 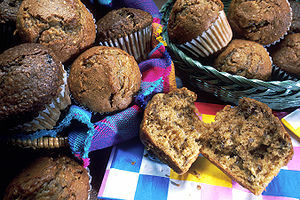 While I was in the waiting room at the doctor’s office this morning (routine visit), I spotted a yummy-looking recipe for nutmeg-parsnip muffins. That’s right. I copied the recipe down on a piece of scrap paper and eagerly awaited being able to make these muffins. I didn’t have all of the ingredients on hand, and in a moment of impetuosity, I decided to swing by the store on the way home from the doctor’s. I was really excited about these muffins, let me tell you. When I parked and hopped out of the car, I saw that my baby had fallen asleep. It was definitely naptime, and I had been hoping to squeeze the shopping in and then promptly put him to sleep when I got home. So I stood there, gazing at my baby. Is there anything more precious than the face of a sleeping child? Hard to say. As I stood there I had an internal debate. Should I wake him up, dash in and out? He’s a mellow kid, and would probably just go with the flow. He’d probably go back to sleep nicely at home. Of course, if it woke him up a little too much, his nap might be stalled, and then it might run into the time when I need to pick his brother up from school. That wouldn’t work. Also, he clearly needs to sleep, and while he is a flexible kid, it might be better to just go home and lay him in his crib. And so that’s what I did. I got back in my car and drove home. He’s sleeping now, and we’re still on schedule for the day, despite the appointment this morning. This small event got me thinking about how a lot of the time, mothers put the needs of their children first. Did I need to make the muffins? No. I can make them a different time. Would it have been the end of the world if I took my child into the store? No. He really is very laid-back. But did I feel that this was the better choice, for both of us, at the time? Yes. I think so. It’s a balance between needs and wants, schedule and spontaneity. Sometimes I don’t know if I’ve made the “right” decision until after I’ve made it, and I feel either satisfaction or angst. I hope that over time I’m able to continually work on my inner compass so that I can make decisions that seem right for everyone, to maintain that balance. How do you work on the balance between giving to your kids and giving to yourself? Very nice post. I find myself in this “quandary” all the time. It’s a fine line between helping yourself and helping your child. I think we tend to go with our child more often than not. This is why the flight attendants tell us to mask yourselves before our children. Excellent point on the airplane masks thing! It is a very fine line, indeed. BRAVO! Not an easy test! It’s important to take care of ourselves and our needs, but that’s not the same as judging who comes first. To take care of ourselves, we need to plan for appropriate backup, tap into our supportive network and be present with ourselves. You’re a great mom. your baby is very lucky to have a mother that is more concerned with his well being than with her agenda. Thanks, Chana. I like how you delineated the difference between taking care of ourselves and prioritizing need. Good food for thought. I so loved this, It is my life’s dilemma. I am always trying to put my children first, and sometimes I forget about myself…the airplane mask is a good image reminder, thank you, Leah. I really would like your recipe for Parsnip nutmeg muffins. You are not alone – I think it’s something many mothers try to balance. As soon as I can find the piece of paper I wrote it down on, I will email it to you!